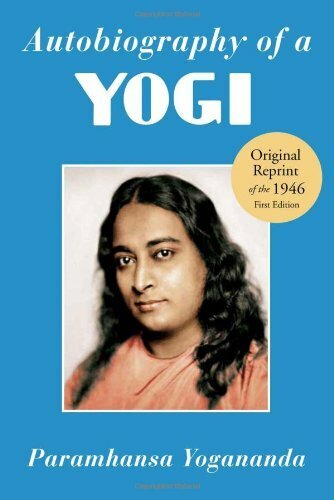 Paramhansa Yogananda’s Autobiography of a Yogi is a quintessential “desert island” book—one to be read and reread, enjoyed and re-enjoyed, with always something new to learn or experience from it. For those of us who are disciples of Yogananda, it can become almost his very living presence. I’m not a big re-reader of books, usually being more prone to feeling panicked about how many books there are out there to keep up with. But I’m on about my 12th time or so through the Autobiography now, and it’s interesting to look back and see what the rereading experience has been like so far. Each time through is unique, often surprisingly so. My reaction to this was to think, “Hey! I have a photo of Lahiri Mahasaya on my altar!” Initially this was in the sense of “Why doesn’t this happen to me?” but luckily it didn’t stay there. Aside from being a reminder of the importance of our gurus’ images, this also inspired me to read the entire rest of the book differently. Instead of thinking of the “I” in this autobiography as someone else telling me his story, I decided to hear these words as coming from myself, actually being the first-person narrator and experiencing these stories, rather than just hearing about them. That can be a very powerful attunement practice for anyone who wants to try it. The more obvious opposite approach works perfectly well, too, of course. Let Yogananda be the “I,” but really try to experience that as a direct, living reality, as if he were sitting down with you, telling his story in person. On other re-readings, I’ve found other themes to naturally arise within the first few chapters and color my experience of the rest of the book. In one case, I simply reveled in the delightful use of language (his style can be a bit of an acquired taste, but I absolutely love it). In another, I became very keenly aware of the humor, and laughed my way through all the nearly 500 pages. In still another, I found myself feeling comforted and loved. This year’s Living Wisdom School play was on the life of Yogananda, and having attended all three performances (and some rehearsals) not long ago, I still have it fresh and clear in my mind. Many of the lines were taken verbatim from the Autobiography, and I find myself rewatching those scenes in my mind as I come to them in the book. Though the play might seem to be an extra step removed from the book itself, I find it adding an extra joyful dimension to the reading, not only from the love I feel for the kids performing it, but from the experience of Yogananda’s life as a continuing, vibrant reality, all these years after the death of his body. Over time, the relationship with the book takes on a reality of its own. As with a favorite movie, I can recite from memory many of the best lines as they come up, and find them more, rather than less, delightful for the familiarity. Various scenes will resonate back to the point in my life when I last read them. Particular teachings will stand out as having been applied in new ways since the last reading, or perhaps as being particularly pertinent at the moment. The book, the guru, and my own life weave together into an ever richer tapestry with every turn of every page. If you haven’t read this book, read it. If you’ve read it, read it again. I think that should cover everybody.